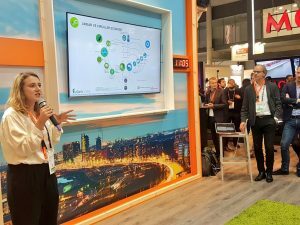 The Amsterdam Smart City is back in the Netherlands after an intense and inspiring week at the Smart City Expo World Congress in Barcelona. Amsterdam was one of the six Dutch cities that showed their projects at the Dutch Pavilion. Besides Amsterdam, Rotterdam, Eindhoven, Den Bosch, Den Haag and Utrecht prepared a smart city track. 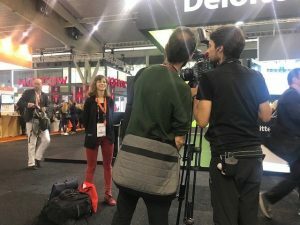 Every city invited companies and knowledge institutions to show what Amsterdam Smart City can offer, but also learn from other cities worldwide. Are you curious about all our activities and learnings? Check this short recap! The Amsterdam Smart City homebase for the week was the Dutch Pavilion. With ‘stand neighbours’ USA , Moskow, Siemens and Deloitte. 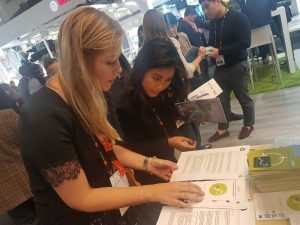 However, because of the large Dutch delegation, the daily pitches on Circular Economy, Data, Sustainability, Mobility, Safety & Security and Healthy Urban Living and the “gezelligheid”, the orange stand became one of the busiest on the Expo. 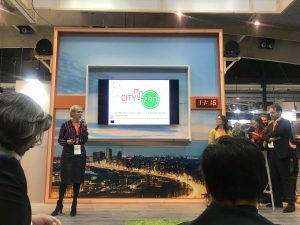 Because The Netherlands is small and because cooperation is better than inventing the wheel yourself, the Dutch cities all focussed on one specific city challenge. 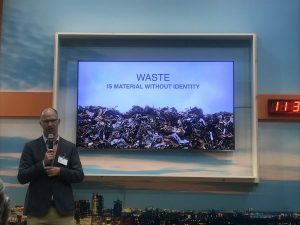 Amsterdam prepared the Circular track and on Tuesday companies and knowledge institutions pitched their concepts, in front of a large crowd. Amongst others, Waternet & City-zen, REPAiR and Madaster shined on stage! Marjolein Bot (City-zen) and Marina Gaton (Waternet) on the biorefiney in Buiksloterham. Tamara Streefland (Metabolic) and Arjan van Timmeren (AMS Institute) on REPAiR. Pablo van den Bosch about the startup Madaster. During the Expo, measurements on the sound were done by the start-up SensorTeam. And some of us, were asked to tell something on camera.